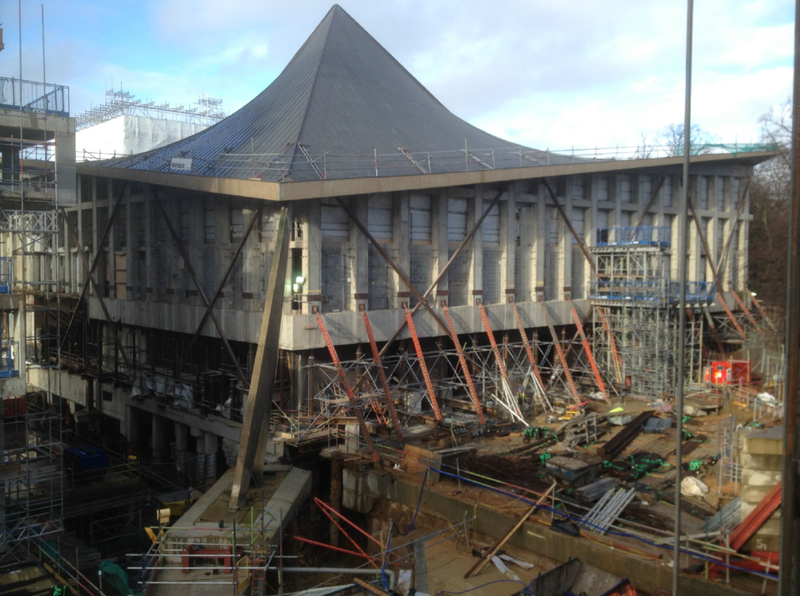 Oasys GSA and AdSec helped structural engineers to preserve the stunning 1960s hyperbolic paraboloid (“saddle”) copper-clad concrete roof at the new home of London’s Design Museum, the former Commonwealth Institute, a Grade II listed building, it is a form seen more recently at the London Olympic Park velodrome. Only 50 years separate the two – but they are a world apart in materials and engineering. Founded in 1989 by Sir Terence Conran, the Design Museum is an undoubted success story and a showcase for the best of product, industrial, graphic, fashion and architectural design. It was soon outgrowing its original home near Tower Bridge and, by 2008, plans were in hand to relocate to the Grade II listed Commonwealth Institute, a 1960s building that had already stood vacant for over a decade. 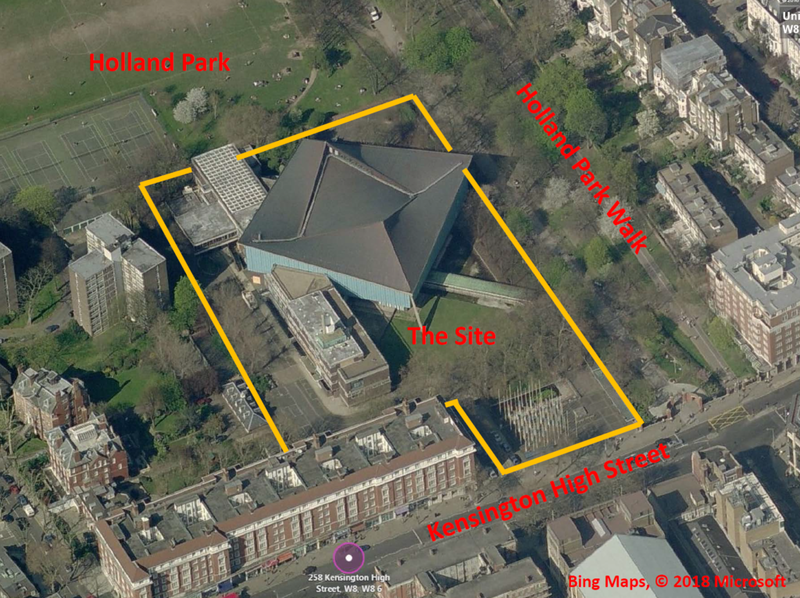 It was clear that creating a modern 21st Century museum would involve architectural transformation, rather than a simpler restoration solution; and the engineering and architectural design of the new Design Museum presented the whole project team with unique challenges. When the Museum reopened at the end of 2016, its new building was perhaps its most innovative exhibit and exemplar of the creative design excellence that it exists to promote. The structural engineering and the architectural design teams have both been honoured with particularly prestigious awards for their work: The Institution of Structural Engineers 2017 Award for Structural Transformation and the 2017 RIBA London Award respectively. One of the engineers from the Arup team involved in the project presented their work at the Oasys GSA User Group in 2018, visit the event page to view his presentation. The architectural vision has been realised as a big, theatrical square atrium, ringed by walkways that lead to the museum’s facilities. At the top you can glimpse the permanent collection; at ground level, steps descend towards a newly-created deep basement containing the temporary exhibition galleries and a lecture theatre. In essence, it was only the distinctive copper-covered concrete roof which was retained. It is too big and far too delicate to dismantle, remove wholesale and replace, the Arup structural engineering project team had to find a way to suspend the whole roof at a height of 20m. This allowed for the existing façade and internal floors to be demolished and rebuilt, and the new basement to be excavated. Ultimately new walls were built up to provide permanent support for the roof. The original roof, designed by architects Johnson-Marshall and structural engineers A.J. & J.D. Harris is one of the few examples of large scale concrete shell structures in the UK. It consists of a central hyperbolic paraboloid shell constructed from post-tensioned concrete. This concept, used frequently in the 1960s and 70s, allows for its smoothly curving shape, formed from a series of straight pieces. At 2000 tonnes the roof weighed as much as four fully laden A380 Airbuses, and it measures 55m x 55m, an area equivalent to 15 tennis courts. It was coated with some 25 tonnes of copper, nevertheless it is very thin (75mm), and damage was likely if movements in the temporary supports exceeded a tiny + or – 5mm while it was on temporary supports. 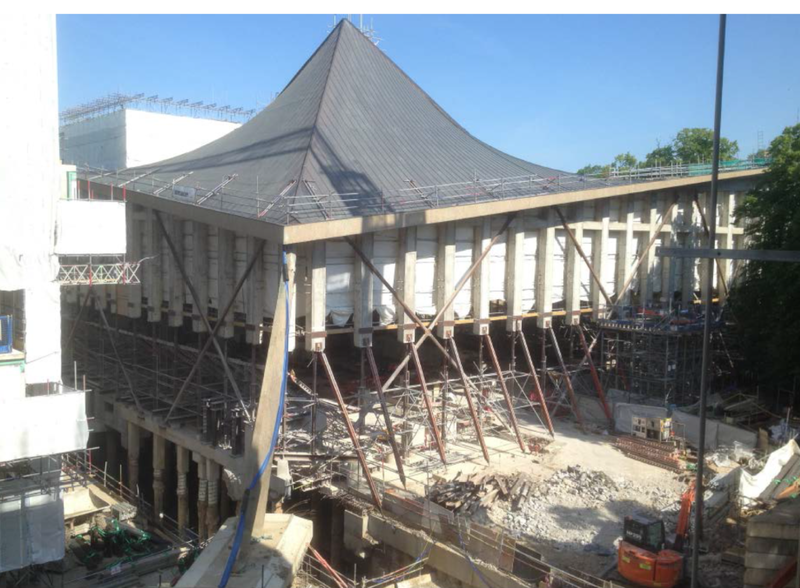 In order to keep the iconic roof intact, the Arup engineering team needed fully to understand the original structural design and how it would behave while supported on temporary works. Contemporary information was available in the form of a partial set of original drawings, archive photos and academic papers (eg Sutherland & Poulton). The engineers painstakingly managed the risks associated with supporting such a large fragile roof so high in the air. 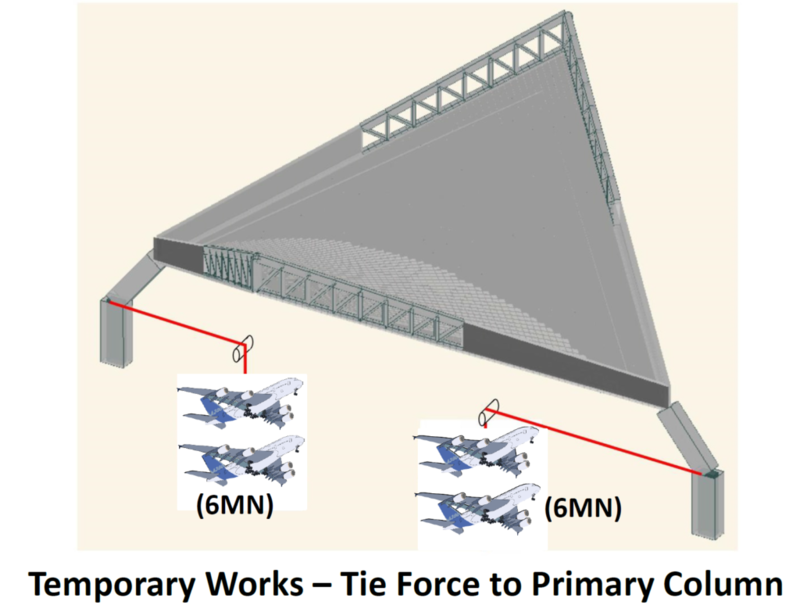 One of their main concerns with supporting the existing roof on temporary works was the potential to alter the existing load path through non-ductile members. Detailed initial investigation, designing strengthening measures, and analysis of various scenarios were undertaken, for the existing, temporary and new permanent condition – amounting to 21 man years of work. The temporary condition assessment was most important, and it involved checking how the structure would respond if one or several of the 70 individual support points moved relative to those around it. These assessments confirmed where the construction sequence could potentially overload elements in the structure, so that mitigation could be planned. Fast processing of data and resolution of queries were prerequisites for keeping the project on time and Oasys GSA was the team’s go-to tool. “It is very easy to learn and use, makes it easy to double-check other people’s work, and is quick to run,“ said senior structural engineer Sebastian Kaminski. “It has all of the key tools required to be able to analyse effectively this complex project. 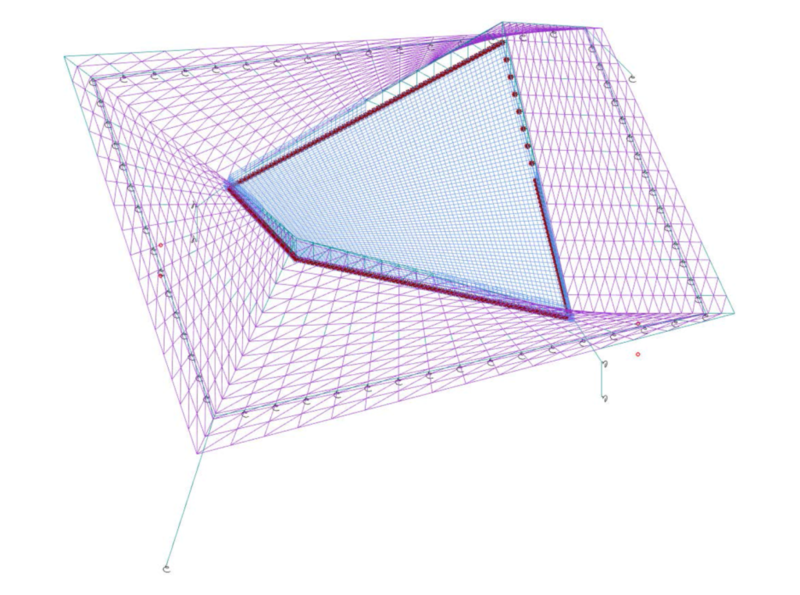 We used the Analysis layer within GSA, modelling in both 1-dimensional and 2-dimensional finite elements, and analysing using both the first order (static) and second order (non-linear) analyses tools. The team also used Oasys AdSec to quickly, reliably and effectively check the loads on the many different and unusual concrete sections. The new Design Museum has been met with acclaim, but how many of the visitors to tis galleries look up and realise just how smart the roof design and its preservation are?